Apple’s much-anticipated HomePod smart speaker will arrive on 9 February 2018, and you can pre-order it now in the United States, United Kingdom, and Australia. Unlike many other products where Apple can’t keep up with demand, there’s still no shipping delay on orders placed even now, three days after pre-orders opened. Apple says the HomePod will arrive in France and Germany this spring, but the company made no mention of Canada or other countries. It costs $349 in white or space gray. If you’re expecting the HomePod to blow away the smarts of the Amazon Echo or Google Home, prepare to be disappointed. From what we know about the HomePod, it will not be able to access third-party services without tapping into a connected iPhone or iPad via SiriKit, unlike the Echo, which lets you install new “skills” on the device. And while the Echo currently offers multi-room audio, the HomePod won’t be able to link speakers together for stereo sound and multi-room audio until later this year. Similarly, AirPlay 2, promised in June 2017 at WWDC, is still described as “coming later this year.” Business Insider has a list of other things the HomePod can’t do, including recognizing multiple users. So what’s the sales pitch for the HomePod? 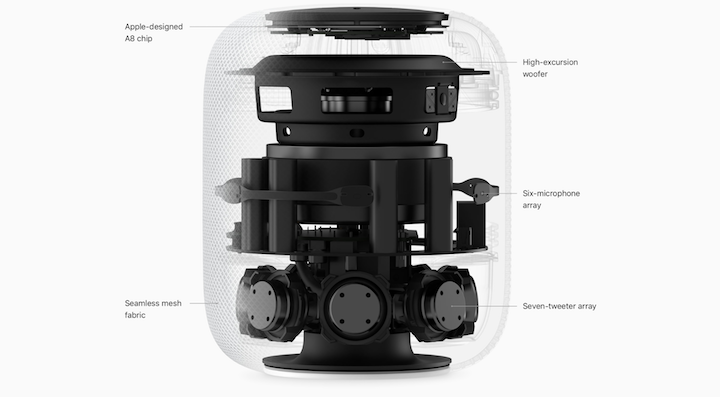 Apple is focusing on sound quality, touting its seven-tweeter array and high-excursion woofer. (Excursion is defined as how far the cone of a speaker travels from its resting position.) The HomePod also features six microphones and an A8 chip to decipher your voice. Apple also touts the HomePod’s integration with Apple services like Apple Music and HomeKit, with which it will be able to interact directly. Also, the HomePod can serve as a HomeKit hub, much like the Apple TV and iPad. The HomePod will not require an Apple Music subscription, but you’ll probably want one to take full advantage of the HomePod. If you choose to abstain, you can still ask Siri to play purchased iTunes music, podcasts, and stream the Beats 1 radio station. But it appears that the HomePod does not support Home Sharing, and thus on its own can only play music that you purchased through the iTunes Store. For everything else, you will be able to use AirPlay to play audio to the HomePod from any Mac or iOS device, just like an Apple TV or AirPort Express. At iMore, Serenity Caldwell has a full rundown on what the HomePod can and cannot play. One thing we now know more about is the tiny display on the top — it’s purely for Siri feedback and manual interaction. Apple has published a guide to the HomePod’s touch controls. Perhaps Apple would prefer that you think of the HomePod as less of its answer to the Amazon Echo and more of an AirPod for your home. If so, that’s going to be a tough sell with Apple’s current messaging. It also feels strange to try to sell a mono speaker primarily on sound quality. Apple fans and audiophiles are tough crowds, and the subset of people who fall into both groups even more so. Siri was well ahead of the competition when Apple re-launched it in 2011, but now it’s falling behind, as you could see at this year’s CES, in which Alexa was crammed into every device imaginable (and probably some that would tax the imagination; see “HomeKit Hardware to Expect in 2018,” 19 January 2018). Ouch. That’s not to say the HomePod won’t be terrific, but Apple’s messaging so far has been underwhelming, and the launch seems unusually haphazard. It’s not a good sign when something misses its initial ship date and finally appears 9 months after it was announced, but with several high-profile features still to come! 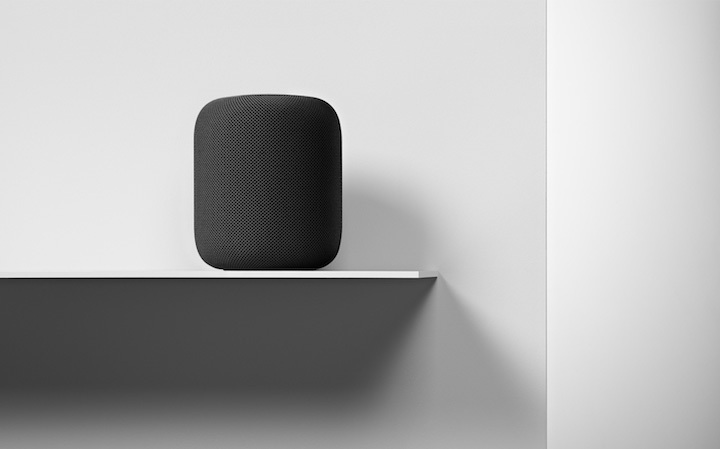 Although several of us will be getting a HomePod quickly for testing purposes, we recommend holding off on pre-ordering until you can read early reviews and listen to an actual unit. No Home Sharing from my Macs or iDevices is a dealbreaker for me. I guess I could hook up an amp and speaker to an AP Express, but that's a bit of kludgy setup. Does anybody have a recommendation for a speaker that would combine all three of those devices so I only have to plug it into power and can then stream via Home Sharing? No Home Sharing, yes, but if you have an Apple Music subscription and have chosen the iCloud Music Library feature in iTunes, I have been told that you can access your ripped CDs in addition to those you have purchased from the iTunes store, and, supposedly, Siri can play them for you. If you don't have an Apple Music subscription, you can AirPlay your iTunes music collection from your Mac to the HomePod, but Siri won't help you out. At least, so I've been given to understand. I'll know more when my HomePod arrives on the 9th. Josh recommends holding off on purchasing HomePod. I see nothing wrong with purchasing, as long as you're willing to take a trip to your Apple Store to return it if you aren't happy. "Apple fans and audiophiles are two tough crowds, and the subset of people who fall into both groups even more so." They would connect an AirPort Express to their existing high-end audio set with an optical cable and be done with it. The HomePod has to sound “decent”. It has to respond to basic commands to play music, turn the lights off and on and set timers and alarms!!! Oh, and tell me the weather! Yes I want stereo pairing and multi-room to work and mabye some more Home Kit tools. No it will not replace my performance listening music system. With a closing note to Apple to please do a better job of helping us understand what your tools can do for us. Meh. Sorry Apple you're at least a day late and a dollar short. Definitely have lost your way under Tim Cook. This product will probably join the Pippin in Apple lore. Who would buy one? It's more expensive that than Amazon's Echo and it can't even reorder coffee for you.